This latest volume in the Combat Aircraft Series (which concentrates on one of the greatest aircraft in aviation history, the technology behind it and the men who flew it) has proved to be an extremely interesting read. Number 49 in the series focuses on the use of the F-14 Tomcat by the Air Force of Iran from delivery in 1977 to the end of the Iran-Iraq War in 1988. Authors Tom Cooper and Farzad Bishop seem to be single handedly documenting the Islamic Republic of Iran Air Force (IRIAF) record in this conflict with a number of volumes now on the subject. Along the way they seek to debunk many myths that have grown about surrounding the ability of the Iranians to operate their high tech American equipment effectively in combat against the Iraqis and their foreign sponsors. 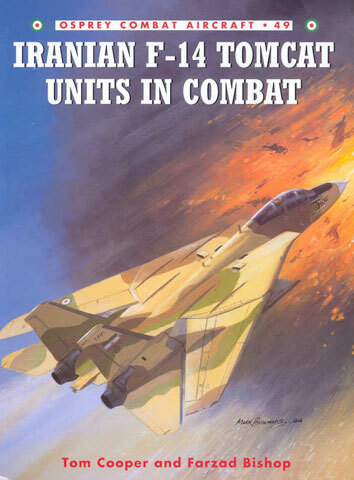 They have previously written books for Osprey including a volume on Osprey’s Iranian F-4 Phantom II Units in Combat (No 37), whilst Tom Cooper has also co-authored a volume on Arab used of the MiG-19 and MiG-21. Regular users of the net will also know of Tom’s website, the Air Combat Information Group. This book is nothing less than comprehensive covering the selection process that lead to Iran purchasing the F-14 in the days of the Shah to counter Soviet MiG-25 overflights, production of the aircraft (during which the Iranians financially bailed out Grumman) and training of the Iranian Pilots. Cooper and Bishop then move on to the real meat of the volume with chapters dealing broadly with F-14 operations grouped chronologically across eight years of war. The access to Iranian veterans both in and outside of Iran and careful research of contemporary reporting ensures that the subject is covered comprehensively. In many cases the authors were able to get first hand accounts of major actions involving the Tomcat, including daring missions escorting strikes into Mosul via Turkish airspace and encounters over Kharq Island when the AIM-54 Phoenix missile was suspected of having destroyed three or four MiG-23s flying in close formation with a single missile. It is clear from accounts included that the Iranian pilots were well acquainted with their mounts and sought to make the best use of the weapons systems in defence of Iran, even if many were tainted as Shah’s Pilots in the eyes of the new Fundamentalist regime. Cooper and Bishop were not afraid to be critical in this volume. Whilst the Tomcat proved highly effective in winning limited air superiority for Iran at certain times during the war, it was not without limitations. The authors highlight the difficulties with the TF30 engine performance, which resulted in combat failures and aircraft losses in much the same way as with the US Navy. Also they highlight the several cases of friendly fire, when Tomcats were lost to Iranian I-HAWK SAMS due to poor coordination. One success that is highlighted was Iranian industry’s success in producing critical spares for the aircraft following the US embargo. This enabled the IRIAF to keep upwards of 30 aircraft operational during the war although at times this dropped to as low as 10. 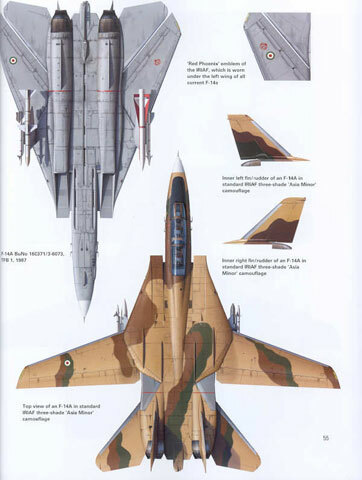 As usual for Osprey Publications, 15 colour profiles fill the centre pages, as well as two four view plates which show the original and post mid-1990s colours schemes applied to the Tomcat. The two-tone grey scheme adopted in the mid-1990s is particularly attractive but unfortunately no colour call outs are provide for (unlike the Asia Minor scheme). Of course they are not going to be FS colours but some indications of matches would be welcomed by modellers. 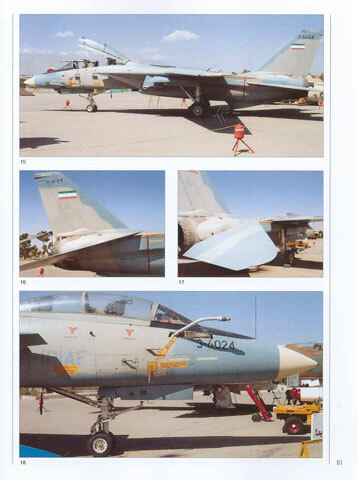 The 18 full colour photos are an excellent addition and provide some of the clearest shots of Iranian Tomcats I have seen. The majority of included photographs are however small and mostly in black and white. Given the obscure nature of the subject the range of photographs is, however, impressive. The comment on the photographs should not put one off this book, as it is an excellent way to add a human dimension the scale models on the display shelves. The book comprises 96 pages printed on glossy paper between cardboard covers.